Making delicious for over 85 years! Two all-time favorites combine for a quick and delicious meal that will please every member of the family! Preheat oven to 350 F. Lay bacon, tomatoes, and onion slices on baking sheet pan and place in the preheated oven. Roast for about 20 minutes or until bacon is crisp. Lay bacon on a paper towel to drain and continue to roast tomatoes and onions another 40 minutes or until golden. Place onions and tomatoes in the bowl of food processor and process until smooth. Pour into a medium-size pot, add chicken stock, and season with salt and pepper. Heat over medium heat until warmed through. Meanwhile for croutons, lay 4 slices of the ciabatta bread on a cutting board. Lay sliced cheese over top and top with another slice of bread. Spread butter on both outer bread slices. Lay sandwiches in a medium pan and cover with a smaller weighed lid or plate to press the sandwiches down and cook 5 minutes or until bread is toasted, turn over and repeat until cheese is melted and bottom bread is also toasted. Cut into cubes. 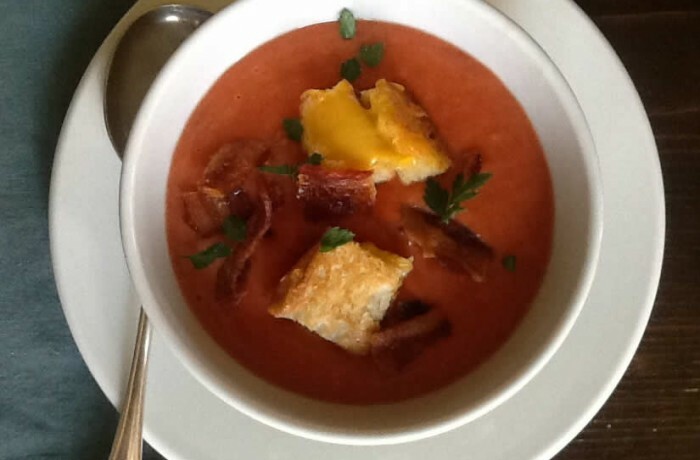 Spoon tomato soup in bowls, garnish with crumbled bacon, grilled cheese croutons and parsley. Enjoy! Copyright © 2017 Square-H Brands, Inc. All Rights Reserved.